Narcisse is at Limit 8 with this outfit that makes me think of a perfect resort destination vacation outfit. I can see myself sipping fruity drinks as I lounge around and look at the tropical scenery while wearing this. I am wearing one of the limited edition colors that will only be sold in a finite quantity at the event. This design is also for sale in other Narcisse colors as well. Make sure to stop by Limit 8 before August 13th. My hair is new by Wasabi at faMESHed. I needed this high braided ponytail in my life and I think it goes perfectly with my vacation vibe outfit. Uber has just opened for a new round and as usual, I need all the things. Today I am showing you the new Neve outfit, Wasabi hair, Cae jewelry, and N-core shoes that can all be found at the new round of Uber. On another note, this round of Arcade only has three days left and the Jian splashy dogs are sooo cute. Somehow the stars aligned and I got the splishy splashy to rez and happen all at the right moment above so that the picture in my head could come out onto the page. I love when that happens (and its rare, lol)! 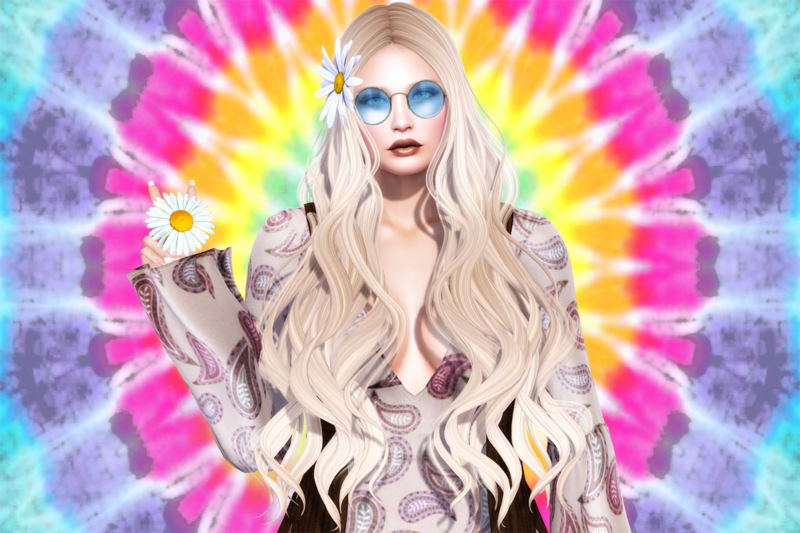 Blueberry is celebrating Second Life's 15th Birthday by giving us 500L store credit and 30% off on select items at the birthday event and also on marketplace. Click the board in the middle of the booth for 500L store credit. You can use it at the mainstore or right there at the event! Once you click the sign, you will have 5 days to use that credit! SLB15 ends July 2nd. Today, I am wearing two newer release items that have been released by Blueberry this month. You can find both the Leah set (right) and the Fye ruched tops and shorts (left) at the Blueberry main store. If you get the fatpack of the shorts, you can write your own text on the front and back. I have "summer forever" written on my shorts today. My shoes, jewelry, and hair are also all new releases. The new round of Rewind has started with a 60's, Summer of Love theme. I love retro designs in SL, so much fun! My wavy middle parted hair is new by Wasabi and comes with the optional hair flower. My mocha lipstick is new and limited edition from Arte at the new round of Limit 8. The Summer Bliss lipstick set comes with 10 colors and then the limited edition pack is 6 colors that will only be sold at this event.